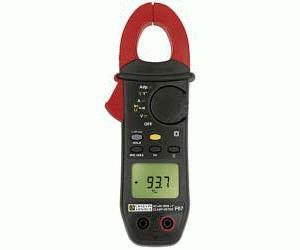 The Model F07 is a high performance clamp-on meter built into a rugged compact sized case, with exceptional ergonomic design and extraordinary measurement possibilities. Integrating a fast microprocessor sampling at a high rate, the Model F07 is completely automatic and performs TRMS measurements on the most distorted waveforms. The Model F07 measures TRMS Voltage and Current and can incorporate the DC component of the signal for the Truest RMS. It has a V-Live™ function to warn of the use of live circuits or elevated voltages.Temperature measurements up to 1832°F (1000°C) can be taken via standard K thermocouple. The Model F07 can measure in-rush currents from 1 cycle up to 10 cycles and frequency. Other features include: auto-ranging, 4000-count display and Auto-Off.